This is tragic and embarrassing. Israel is calling the tune for the Obama administration on Gaza. In the last 24 hours since the alleged capture of an Israeli soldier by Palestinian militants, the Obama administration is now laying all blame on Hamas for Israel's slaughter of over 1,300 Palestinians in Gaza. What other nations are calling a massacre and genocide -- our government is calling the Palestinians' own fault. 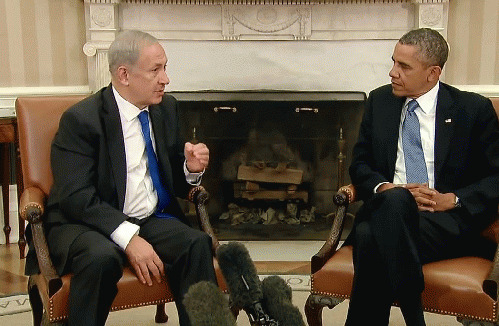 At the President's press conference, Obama emphasized Israel's right to defend itself, no matter what. He only touched on the civilian killings issue a couple times, and said it was Hamas's fault. "I'm in constant consultation with Prime Minister Netanyahu. ...[I]t is heartbreaking to see what's happening there, and I think many of us recognize the dilemma we have. On the one hand, Israel has a right to defend itself and it's got to be able to get at those rockets and those tunnel networks. On the other hand, because of the incredibly irresponsible actions on the part of Hamas to oftentimes house these rocket launchers right in the middle of civilian neighborhoods, we end up seeing people who had nothing to do with these rockets ending up being hurt." Not a word of blame on Israel. Though the president adopted the word that four others in his administration have used to describe massacre: "heartbreaking." "Now, at the same time, we've also been clear that innocent civilians in Gaza caught in the crossfire have to weigh on our conscience and we have to do more to protect them. A cease-fire was one way in which we could stop the killing, to step back and to try to resolve some of the underlying issues that have been building up over quite some time." "Netanyahu added that he now 'expected' the U.S. and other countries to fully support Israel's offensive in Gaza, according to those familiar with the call." "Condemn in the strongest possible terms today's attack in #Gaza -- an outrageous violation of ceasefire negotiated over past several days." Obama's press secretary called the capture of the soldier "barbaric." What does that make the Israeli onslaught on Gaza -- civilized?